Woodstock is a town in Carleton County, New Brunswick, Canada on the Saint John River, 103 km upriver from Fredericton at the mouth of the Meduxnekeag River. It is near the Canada–United States border and Houlton, Maine and the intersection of Interstate 95 and the Trans-Canada Highway making it a transportation hub. It is also a service centre for the potato industry and for more than 26,000 people in the nearby communities of Hartland, Florenceville-Bristol, Centreville, Bath, Meductic, and Canterbury for shopping, employment and entertainment. Woodstock was possibly named after Woodstock, Oxfordshire. The name is Old English in origin, meaning a "clearing in the woods". Little is known of the area before it was settled by disbanded veterans of De Lancey's Brigade following the American Revolutionary War. The veterans moved there in late 1783. The 26,000 acres grant was to 110 men. Not all took up the offer, and of those who did, not all stayed. By 1790 only 23 families were present, and by 1804 only 10 of the original men had possession of the land. According to the diaries of Frederick Dibblee mills were present from 1805. Export of timber via the Saint John river began about this time. When Carleton County was created in 1831, Woodstock was made county seat, and a jail, court house and registry office were installed. From 1837 William Teel Baird operated a pharmacy. The first steamboat from Fredericton reached Woodstock in 1837 and a regular service was established in 1845. By 1847 the population was at 2,000 and the town had four churches, a bank, and a grammar school. On The Twelfth (Orangemen's Day) of July 1847 a riot took place at the corner of Victoria and Boyne streets near the site of the Orange Hall, built in 1848 and now a vacant lot. It was a conflict between Protestant Irish immigrants of the Orange Order and Catholic Irish immigrants. Around 250 Orangemen clashed with an equal number of Irish Catholics, leading to 10 deaths and many more injuries. It was a result of years of tensions. Subsequently, only Catholics were brought to trial. According to the 1851 census there were 488 inhabited houses, and nine places of worship. Immigration was important, with the majority coming from Ireland. 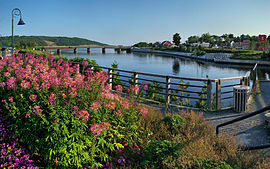 The town was the first in New Brunswick to be incorporated, in 1856. The first mayor was Lewis P. Fisher. He made provisions in his will for the building of several educational institutions, among them the first Agricultural and Vocational School in Canada, and the L. P. Fisher Public Library. In 1861, the newly built railway between St. Andrews and Woodstock was seized by several hundred navvies, angry at not being paid. A peaceful settlement was later made personally by Arthur Hamilton-Gordon. The first telephone was installed in 1885 by H.V. Dalling, a homemade telephone whose wires ran between his home and shop. The Bell Telephone Company later opened a small telephone exchange in his store. In 1887, Tappan Adney, visiting Woodstock, learnt birchbark canoe construction from a Maliseet, preserving and document the building process. The headquarters for the New Brunswick Railway were here from 1870 until it ceased functioning. The first dam at the mouth of the Meduxnekeag River was built in 1886. In the 1880s Woodstock had two small electric companies related to the Small & Fisher and Connell Brothers iron foundries. These were superseded by the Woodstock Electric Railway Light and Power Company which in 1906 built a dam and a powerhouse on the Meduxnekeag for distribution of power to the town. The first hydro-electric station in New Brunswick, the Hayden dam and its power station was destroyed by a freshet in 1923, which also washed out the bridge that crossed the Meduxnekeag. In 1995, the Town of Woodstock opened the Carleton Civic Centre. The multipurpose complex houses a 25-metre indoor swimming pool, an 846-seat arena, a fitness centre, and community meeting rooms. The Woodstock Slammers of the Maritime Junior Hockey League played previously at the Ayr Motor Centre. The annual Woodstock Old Home Week activities are centered around Woodstock and the fair grounds at Connell Park. Activities include parades and fireworks, a gospel concert, 4-H activities, Miss New Brunswick talent show & pageant, beautiful baby contest, horse pulling, harness racing, and a demolition derby. The Dooryard Arts Festival is four days of music, art, theatre, stories, workshops and an open-air market. A campus of the New Brunswick Community College, Townsview School (Grades K-8), Meduxnekeag Consolidated School (Grades K-8), and Woodstock High School. Woodstock is located on New Brunswick Route 2, an alignment of the Trans-Canada Highway. The shorter New Brunswick Route 95 extends westward from Woodstock to the Houlton/Woodstock Border Crossing, where it continues into the United States as Interstate 95. The small public Woodstock Airport is in nearby Grafton, New Brunswick. Regional geology consists of shales over a Late Ordovician to Early Silurian formation. Iron-manganese and iron ore occurrences were reported in 1836 during a geological survey conducted by the state of Maine. The Woodstock Iron Works ran from 1848 to 1884, closing because of competition from the United States. Today Minco owns 100% of an 880 hectare manganese claim, about 6.3 km northwest of Woodstock. Samples were taken in 2010, 2011, and 2013. Minco plans to produce manganese well below the typical cost for the industry. The manganese would be used in the production of stainless steel. Woodstock's radio station is CJCJ-FM. The newspaper is the Bugle-Observer. Many of the original wooden buildings have not survived into modern times. Calamities over the years included a hurricane in 1836, and fires in 1860, and 1911, As a result, much of downtown was rebuilt in the brick that remains today. Before the arrival of the railway, businesses faced the river banks, since they provided transportation, energy, and water. With the switch to rail and road traffic buildings face roads instead. The George Frederick Clarke house, built in 1905, is a provincial historic site valued as a rare example of residential Regency architecture. The Old Carleton County Court House was built in 1833. When new court house was constructed, the old one was used as a horse barn from 1911 to 1960 when it was purchased by the Carleton County Historical Society. It was the site of the George Gee trial, and that of Minnie Bell Sharp who ran the Woodstock School of Music in the early 1900s. The Maliseet Woodstock First Nation is about 9 km south of the town on 426 acres with an on-reserve population of 291 and an off-reserve population of 721. Woodstock experiences a humid continental climate (Dfb). The highest temperature ever recorded in Woodstock was 39.4 °C (103 °F) on 18 August 1935. Woodstock, along with Rexton and Nepisiguit Falls share the record for New Brunswick's highest recorded temperature. Woodstock elects a mayor and a town council every four years. All councilors are elected at-large. The last election was May 2016. The chief administrative officer and the administration department is responsible for the town financial matters, record keeping, implementation of policies and directives, and providing support to all other departments and the town council. The position of chief administrative officer was formerly known as town manager. Woodstock was the first town in New Brunswick to have a manager-council form of government. The Woodstock's other town departments are Business Development, Development & Inspectional Services, Fire, Police, Public Works, Recreation, and Tourism. ^ "Woodstock (NB)". The Canadian Encyclopedia. Retrieved 7 January 2017. ^ "Welcom". www.gwcc.ca. Greater Woodstock Chamber of Commerce. Retrieved 2017-01-07. ^ Ketchum, TCL (1923). A short history of Carleton county, New Brunswick. Woodstock, NB, Canada. ISBN 978-1331465379. Retrieved 6 January 2017. ^ a b c d "Town of Woodstock". Carleton County Historical Society, Inc. Retrieved 6 January 2017. ^ Baird, William T. (1978). Seventy years of New Brunswick life: autobiographical sketches (Reprint ed.). St. Annes Point Press. pp. 156–162. ISBN 978-0-920762-00-4. Retrieved 28 March 2013. ^ Campbell, John. "Orange Hall - Woodstock". Retrieved 25 June 2012. ^ Connell, Allison (1988). A view of Woodstock : historic homes of the nineteenth century. Fredericton, N.B. : New Ireland Press. p. 19. ISBN 0920483194. ^ Bell, D. G. "The Battle of Woodstock". Carleton County Historical Society. Retrieved 3 November 2010. ^ "Orange Riot Site". Canada's Historic Places. Retrieved 7 January 2017. ^ New Brunswick. House of Assembly (1863). Journals of the House of Assembly of the Province of New Brunswick. G.E. Fenety. pp. 114–116. ^ Thompson, Colleen Whitney (1994). Roads to Remember: The Insider's Guide to New Brunswick. p. 58. ISBN 0-86492-160-8. ^ "in the beginning - electricity comes to New Brunswick" (PDF). NB Power. Retrieved 7 January 2017. ^ "Meduxnekeag Heritage". Meduxnekeag River Association. Retrieved 7 January 2017. ^ Campbell, John. "Power House and Dam". Retrieved 25 June 2012. ^ Campbell, John. "1923 Flood". Retrieved 25 June 2012. ^ "Woodstock Old Home Week". Retrieved 5 January 2017. ^ "Info". Dooryard Arts Festival. Retrieved 5 January 2017. ^ New Brunswick. General Assembly. Legislative Council (April 1864). "Report on Mines and Minerals: Woodstock Iron Works". Journal of the Legislative Council of the Province of New Brunswick ... Early Canadiana Online. pp. 55–59. (Subscription required (help)). ^ "Houlton Woodstock Zone - Manganese". GLOBEX. Retrieved 7 January 2017. ^ "Woodstock Project, New Brunswick". Retrieved 7 January 2017. ^ Dean, Katelin (May 1, 2009). "What's in a name". Bugle-Observer (Weekend). p. A3. ^ "Destructive Conflagration". Nashville Union and American. 19 Apr 1860 – via newspapers.com. ^ Campbell, John. "Hayden's Saw Mill". Retrieved 25 June 2012. ^ a b "History". Town of Woodstock. Retrieved 7 January 2017. ^ Eiselt, Marianne; Eiselt, H.A. (2002). Discovering New Brunswick. Halifax, N.S. : Formac Pub. p. 11. ISBN 0887805566. ^ "History". Woodstock First Nation. Retrieved 5 January 2017. ^ "Woodstock". 1981–2010 Canadian Climate Normals. Environment Canada. Retrieved 29 May 2016. ^ "March 2012". Canadian Climate Data. Environment Canada. Retrieved 29 May 2016. ^ "Mayor & Council". Woodstock. Town of Woodstock. Retrieved January 24, 2015. ^ a b "Administration". Woodstock. Town of Woodstock. Retrieved January 24, 2015. ^ "List of Past Town Managers" (PDF). Town of Woodstock. Retrieved 2015-01-24. Wikimedia Commons has media related to Woodstock, New Brunswick. Wikivoyage has a travel guide for Woodstock (New Brunswick).